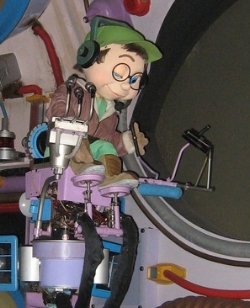 You have no idea who I am and I’ll be honest, I only know you from your personal submarine welding experience at Sea Castle as well as the demonstration of imagineering excellence you have bestowed up on the Disney theme parks over the years. This letter doesn’t serve as anything more than part rant, part excitement, part sadness for the EPCOT Center that is gone, but most importantly, part relief that someone of your stature will soon be in charge. I don’t have to tell you that EPCOT needs help. Otherwise, you wouldn’t have been put into this position and there never would have been such an audible cheer across the twittersphere when it was announced that you would soon be at the helm. I’ll admit, I had this overwhelming feeling of excitement and ideas quickly bubbled up when I thought about possible changes and all the things that EPCOT was years ago. The ideas kept coming and coming, so much in fact that I had to write them down and get them out into the open. So that’s what this letter is, a brain dump of ideas, but it’s spoken not from someone who misses the EPCOT of old, but from the entire community that loved EPCOT years ago and wants to feel the same again. So lets start with names, we all know EPCOT is an acronym, and there is no point going into what it means and stands for – we all know. The full name should be EPCOT Center. No, it’s not Epcot, and it’s not Epcot in a cute circa 1998 script font with a sequined wand hanging over Spaceship Earth. It’s EPCOTCenter because it would have been the – Center – of Walt’s original plan, and now it should be the center of the creative visions of tomorrow and demonstration of the world and its inhabitants. 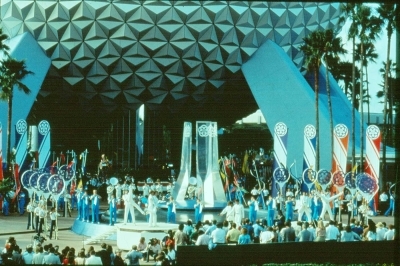 Each Future World pavilion used to have its own stylized logo. Via color or symbol you knew what the pavilion was; the signs easily told you where to go. The distinct character of each logo gave a uniqueness to each pavilion, yet all combined, they created a symbiotic relationship between the entire set. It made sense and we all liked it. Sometime, somewhere, someone though it would be a great idea to remove those logos and colors, now the signs look like nothing more than some corporate industrial park entrance sign. Maybe it won’t be colors, maybe you’ll make new symbols, but bring the pavilions together again in a cohesive fashion, even if it is for the sake of maps and navigation. Years ago there was an amazing sense of wonderment as you walked through the park. The songs that could be heard playing toyed with our imagination and are now engrained in our heads until the end of time. Where did that instrumental version of One Little Spark go? Why can’t I hear the overatures that were written for EPCOT, are they just not “hip” enough for today’s mp3 techno crowd? They are as classic as any Disney song and they should be piped in around the park once again. The musical geniuses at Disney can certainly whip up some new ones as well. Time to move “Leave a Legacy” to a more fitting location; navigating this maze of gravestones and cheap 4bit graphics gives no sense of wonder as you approach Spaceship Earth. There was a time when the wide open tracts of space with flower plantings all pointed in one direction and lead you to the fountain. Bring back the fountain, bring back the open feeling. I don’t doubt there are those that want to see their leave a legacy images preserved, and they have every right to have them kept, but either scatter them around the park or move them to another location that isn’t obtrusive to the integrity of the park. Oh, and that music I mentioned, it should be playing everywhere in the entrance area. This attraction has been minimally touched over the years [in the grand scheme of things], and for the most part the changes have done well to keep the original message of the attraction. However I do have some criticism towards some of the improvements… Years ago, as you approached the apex of the attraction, the music reached a crescendo and you were treated to an amazing view of the earth rising and the powerful soundtrack taking over. Chills would run down my spine, I was proud and amazed at the same time. But now reaching the top of Spaceship Earth is anti-climatic and lacks any awe or desire to do it again. It is time to fix this, and while you’re at it, make the descent a proper tribute to the future and tomorrows child. We don’t have to hear that song again, but give us something to look at other than 9″ LCD screens, we get enough of that every day on our smart phones. Make us want to change the future with our children, not just how how we will be a part of it. Yes, Communicore. Dump the cheesy Innoventions name, it sounds like it was an Innovention itself. I agree these areas should be fluid and ever-changing as new companies come and go. Isn’t that what Walt wanted? Change and display of new technologies. This is the place to do it. Yes of course, it is “kind of” being done with Innoventions, but it could be done on much grander scale, and the presentation could be improved as well. Sum of all thrills – Good idea, but not quite. This should be a tribute to classic Disney attractions. Through the use of video, 3D/4D and virtual reality technology create experiences of now closed/dismantled attractions. Imagine climbing in and descending 20,000 leagues under the sea, zipping around with Mr Toad or cruising through the World of Motion. Wait, what is that I smell, oranges? We must be at Mesa Verde! A pavilion that once truly felt like you were visiting another location was turned into a dark void of speckled blue paint. What on earth was the team thinking? No no no.. A few hundred gallons of paint, some stencils and Imagineering know-how will bring back the brightness that was once Sea Base Alpha. The new beach entrance is good, but no one ever realizes that you “descend” underwater. They all look up and say “hey look, a boat” giggle and move on. That area should be changed so the that queue is ON the dock. With the sea-cab track expanded to the original layout and those boarded up windows once again opened to the big blue world, visitors would board the new sea-cabs above the surface at the edge of the dock. Sea Cabs should look like something that could go underwater; then as the ride starts Nemo and his friends take you down into the water (something like Little Mermaid, but better) and quickly introduce you to the undersea world. Going past darkened LCD screens with lame projections of characters screaming for each other is not immersive. And please don’t forget, at the end of the line make sure you hear “Welcome, to Sea Base Alpha”. I’d ask for the hydrolators to make an appearance again, but that is probably asking for too much. Oh Simba, every time the light touches the film it gets older and older. Seriously good message; time for a new film – but you already know that. I understand the cost cutting measures on the Living with the Land removed the live spiel, but make the tour more enticing, and bring back the heat in the desert scene; that was gone years ago. We would love to see Tiny Little Seed come back, cheesy and catchy all at the same time. Focus the ride on organics and non-GMO foods; more alternative foods and healthy choices. I don’t think I have to write much about this here. If you want to win the hearts of fans, you know that our favorite purple dragon and his bearded steam-punk owner need to return in some shape or form… I’m not asking for the original ride, but bring back the feeling that was lost. And while I personally enjoy British humor, Eric Idle isn’t in the right place at the “Institute”. Ditch the white coats. This isn’t a lab – your imagination is in your head and what you make it to be. Imageworks – Do we even have to to discuss this one? 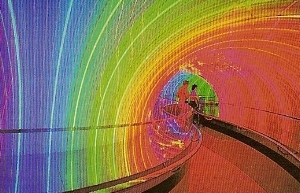 There is an amazing neon rainbow tube and shell of a former imagination playground just waiting for new technology. I won’t be offended if you replace the neon with LEDs, they will be more eco-friendly, just retain the same feel and awe we used to have. This needs help, 99% of the visitors call it “the ride with the dinosaurs in it”. Children crave to see 5 minutes of dinosaurs while suffering through 40 minutes of droning on and on. You’ve got a 30 year old, yet still innovative, rotating screen technology that could be amazing if done right with hi-resolution LED screens. On top of that, you have a moving theater, and huge movie screens. Yet, other than the dinosaurs, the ride continues to bore most visitors. The running time needs to entertain guests; they have more entertainment in their pockets these days. It’s time make it immersive; feature new energy technologies such as solar and wind; explain and demonstrate how energy can be used in the home more efficiently, CFL vs LED lights, petroleum products from algae…the list goes on. Think first half the history and dinosaurs, smog, choking and over-use, second half the promise of new clean, safe and reliable energy methods. Then hands on exhibits to inspire; breaking the attraction up into smaller chucks and interactive hands-on activities. And “Oil Shale, the rock that burns” should be put back into the script and never ever be removed. You may have this one ready for something other than private and special events. I’m not proposing the previous pavilion come back, but you’ve got space for something new and exciting. Others will say the Body Wars simulators still exist, I’m not about to touch that. Now I do understand that with a portable AED we may be able to shock Buzzy back to life for a reprise role in an all new setup – hmmm, with Pixar releasing “Inside Out” in a year or so, this could be promising. This is begging for a proper tribute to Horizons, make this a departure from Futureport and a trip to Brava Centauri where we see the vision of the future. Don’t go the hokey Hollywood effects that you have now. Besides looking dated, do we really need Gary Sinise? I know he was in Apollo 13 but he didn’t lend much here. I know there is tons of money sunk into this building, but for an E-ticket ride, no one really cares to run to it, its self-demoted itself to a C-ticket attraction just by the nature of it. 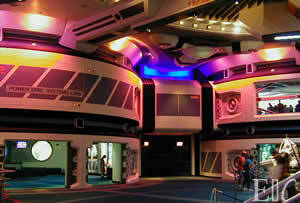 I know it would be too much to ask to bring back Horizons, but something is needed. There is no way to bring back the World of Motion, but you’ve gone from an immersive ride to one that is highlighted by blacklights and lame neon lines. The “story line” of testing your car is hard to follow. It’s overloaded with to-dos and options and the ending is lacking something. I know what was aimed for, and I think with a few tweaks the nail could be hit on the head. Since this change is so new there is no way this will be on your first-hit list; so I’ll let this one slide. Not much has really changed here, well physically speaking, since opening day. Promises and visions of new countries have long disappeared, so much in fact, that if a new country was announced tomorrow, I’m not sure if people would actually believe it. What has changed is the lack of pride by the hosts and hostesses; they used to be so much more charming and proud of their countries. Now you have Norwegians telling you to skip the movie because Norway isn’t even like that. Eek. Yes new countries are needed and new attractions should go along with them. We’d love to finally see the Germany Rhine River Cruise or the Mt. Fuji roller coaster (don’t even go there with the Kodak vs Fuji Film debate); but in our hearts we know those will never materialize. But new visions of new countries and other attractions could breed new life into the showcase. I will commend Imagineers of days gone by on a job well done with World Showcase – My grandmother would see a foreign country on television and comment “That’s just like EPCOT”… we didn’t have the heart to tell her it was the other way around. Oh one more thing for my grandparents, bring back the “Jitney Bus”, but please don’t load it with a steel drum band again. So that the end of my rant, wish list, whatever you want to call it. By no means is my list of ideas complete, these are just things to get you and your teams’ creative juices flowing. 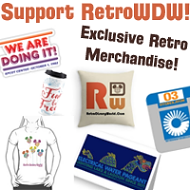 I’m not expecting you to call me up and ask me to join your team (not that I wouldn’t mind doing that), but I’m just one voice speaking for many out there that want to see EPCOT Center return. You probably know everything I spelled out here, but for me it was important to put it down and call it all out. I’m not asking for the 1980’s EPCOT to come back in all its glory…I know it may sound that way as I took a very retro-centric view at this. My main point is that EPCOT has lost over time what it was designed to do. When we look back on our memories we see aspects of the park that are now gone, one by one they don’t fell like a huge loss, but on the whole they all contributed to the loss of the original EPCOT vision. If you can re-inspire those feelings and memories then EPCOT will resurface as an amazing theme park. What EPCOT needs is the spirit of free enterprise, the promise of tomorrow and a clear vision to be a showcase to the entire world. Bring that back, and you bring back EPCOT and instill new memories to new generations. If there is one thing that EPCOT Center taught us all, it’s the promise of a better tomorrow and hope for the future. Call it cliche, but Tom, you are now Tomorrow’s Child for EPCOT Center. I wish you well in your new position and look forward to the new horizons ahead of us; and please let us know if you ever got the laser locks welded to the sub? This letter is basically asking Fitzgerald to turn everything back to the way it was in the 80’s. Listen, I’m an early EPCOT fan as much as anyone, but I think that doing that is not the right step forward. For a park who’s about the future, the last thing it should be doing is going back to the past. I’d much rather it gave me what I didn’t know I needed instead of what I think I want. I think your letter is exactly what EPCOT needs!! Its not about going backwards to the 80’s as someone stated. Its about taking what worked back then and applying it today using new technology. Its a simple solution that will bring back what EPCOT has lost. Great job and I enjoyed reading it, hopefully ol’ Tom will as well!!!! ѕo here it tames plаce. I’m late to the party, but bravo. Thanks for writing this. Epcot, today, is a disgrace. Here’s hoping it returns to glory, and soon. Kane: Are you lost, sweetheart? Are you ‘fraid, honey? Well then, why don’t you come with me? Kane: Alright then! I’ll sing you a song… until your mom comes back! Kane: God is in His Holy Temple! Earthly thoughts be silent now! Nice letter, I miss the old Epcot Center! So this is the first time I’ve read this and I LOVE it. I feel it. I wish something like this WOULD be done. You can’t see me right now, but I am standing and applauding. I would like to talk to Tom Fitzgerald. If you could please give me a call. I have lots of question to asked about soarin Epcot.